That was the start of a lasting friendship. Nick was my second father, my excuse to escape from my strict mother and go out at night, drink beer, meet new friends, and dance. He would bring me to Ishmael Bernal’s When It’s a Grey November in Your Soul café. Nick would push aside the tables and chairs and make room for a dance floor. He would take my hand and we would tango. Each time he would dip me, he would laugh at my surprised reaction. Fun didn’t extend to the small hours because when the clock struck midnight, he would say, “Time to take Cinderella home!” And off we went in a taxi that was our pumpkin carriage. Whenever it was someone’s birthday, Nick would greet us happy birthday on the phone. He would address us by the name of our patron saint, for he knew each and every saint on each and every day of the year. Hence, my mother, Gloria, was Asuncion, my sister, Pfootsy, was Marta, and I was Patricia. Even without a party, he would come to the house with lechon, fried chicken and brazo de mercedes. Sometimes he would bring along some friends, and that’s how we got to know Elena Roco, his constant female companion. Nick was fond of music and the movies. He would request his favorite songs to be played a million times over, and and he would sing along in his baritone voice. For Nick, the best films of the century were those of Greta Garbo and Fred Astaire. 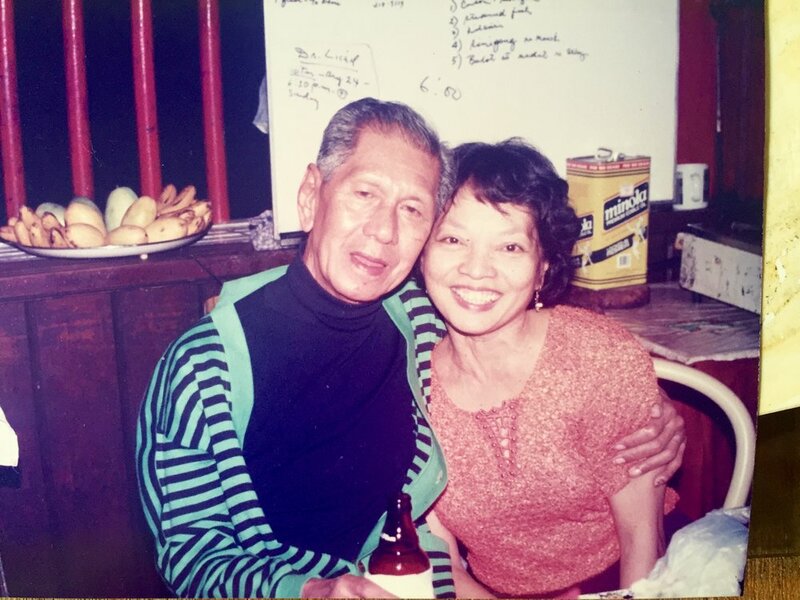 The one and only classical piece he loved was Debussy’s “Claire de Lune.” One day, Cecile Licad, Nick’s comadre at my son’s baptism and confirmation, was in my parents’ house. Cecile began to play the piano with her usual flair and passion. Nick interrupted her and cried, “’Claire de Lune,’ dahling, play ‘Claire de Lune!’” Cecile stopped, smiled and gave in to Nick’s request. On one of Nick’s visits to my parents’ house, he asked my son, Kris, if he was willing to be literary editor of Mirror Weekly magazine, the sister publication of Graphic magazine. When Kris didn’t answer—either he didn’t hear anything or if he did, he must have been so surprised he didn’t know what to say. Nick then turned to me and asked me to replace him as literary editor of said magazine. He said he was tired and that younger people should take over. I accepted the offer on the condition that contributions would be in Filipino and in English. I was also asked to write a regular column in Filipino. Was Nick Joaquin ever political? Yes, often. He writes about a controversial issue from several angles. You only have to read between the lines and understand his wit and humor in order to decipher his true feelings. In fact, it’s common knowledge that Nick, although part of Free Press management, supported the labor union for he believed in its just demands. Neither egoistic nor egotistic, Nick never promoted himself, never talked about his writings, never counted his awards. Whenever a celebrity or person in power was around, Nick would avoid that person like the plague. This, partly because he was shy. Also, partly because he couldn’t care less if that person was popular. So, Nick wouldn’t go near a movie star, a representative, a cabinet member, a senator, and the President, even if he knew them. They approached Nick. One thing I can never forget is when Nick fetched my mom, and went to Ninoy Aquino’s house on Times St. We joined the procession on foot from Times St. to Santo Domingo church, where Ninoy’s wake was transferred. All the way from Times St. to Santo Domingo, Nick and Mama walked hand in hand. Nick, I’ll always remember you, not for your literary awards, but for your inimitable, scintillating writings. Above all, I’ll always remember the warm human being that you are. As your favorite song goes, thanks for the memories. Marra PL. Lanot writes poetry and essays in Filipino, English and Spanish. She also writes for newspapers, magazines and television, and has attended as invited delegate to various international literary/poetry festivals, the most recent ones of which are in Colombia (2013) and in India (2014).